Hot smoke rises to the ceiling and spreads out, so a central position is the preferred location as it is ideal for maximum room coverage. Should the requirement be for positioning off centre keep unit at least 600 mm (24 inches) from room corners. This is because the air here is dead and slow moving. On peaked or sloping ceilings install 90 cm (36 inches) from the highest point measured horizontally. 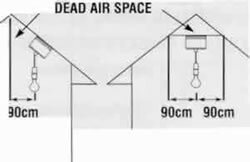 This is because dead air at the apex may prevent smoke from reaching the unit. This unit is NOT suitable for WALL MOUNTING.